So it's Yom Hazikaron in Tel Aviv. Tonight, I heard the siren on the bus for the first time. I had always wondered what people riding on a bus did when the remembrance siren that sounds all over the country goes off for a full minute. Well, I don't know what every bus does, but ours stopped mid-street, everyone got out of their seats (driver included) and we stood solemnly, many with tears in our eyes, thinking whatever the siren made us think about. 1. I have been pretty sick with intense allergies since I got back to Israel. Weirdly, one of the reasons I loved Israel in the past was because I didn't have the killer seasonal allergies I did back in NYC. Whoops, guess I do! Just decorating my new balcony! Thank you for your warmth. Thank you for inviting me and hugging me and caring about me like your own family. Because honestly, I am. Thank you for inviting me to dance and joining me in lchaims! Thank you for dealing with (and not dealing with) my Hebrew and my accent. Thank you for building this amazing place in such a blindingly short period of time. Thank you for making the desert bloom, and helping the world every time it needed it (and being so gracious when the world rarely thanked you.) Thank you for your sons and daughters, and the incredible sacrifices they have made to ensure Israel can endure under incredible pressure. Thank you for being our sanctuary. Thank you for being the one place in the world where a Jew can be proud to be a Jew, where wearing a kippa won't get you punched, where a kosher meal is just around the corner (and then around the next one), where the calendar is lunar and the holidays have been celebrated by my people for centuries. Thanks you for taking in the survivors of the Shoah and the refugees from the Middle East, the tribes of Ethiopia and and India and the persecuted of the Soviet Union. And though some in America may forget (willfully or not), I will not forget the home you have given to millions of Jews in need, Jews truly escaping from exile. You are impatient and you are generous to a fault. You are aggressive and you love fiercely. You are argumentative and you are innovative. You hate so much about this country and love it fully. Sometimes you leave because the golden streets of America (or Canada, or London, or Australia) call you, but you always know that this is your home. You are beautiful and complex, you are so young and you are ancient. You are left and "hard right." You are vegan and you barbecue for every occasion. You are ultra-Orthodox and you are the most progressive country in the region. 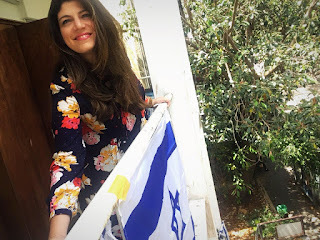 You are Jerusalem and Tel Aviv, but you are also Haifa and the desert and the mountains and Tzfat and Judea and Samaria and all of you is home. My blessing to you is limitless success and wealth. May we build together a land so full of material wealth that American Jews come here to build their fortunes! May you continue to grow in number and in joy- may we unify as a people in a land as we were always meant to- one Nation with one heart. And may our differences not tear us apart, may they teach us more about one another. May we realize that we, each other, are the greatest gift we have. And may we celebrate many more smachot together. My blessing to you is safety and strength. May our holy army remain safe from harm, and may our enemies see no fruits from their terror. May G-d continue to watch over His people and His country, so that in the next 70 years and beyond, we know only peace and happiness. Thank you for welcoming me and thank you for being my Home. Chag Haatzma'ut Sameach to everyone!